Travel fever is raging rampantly. As a result of somewhat poor financial situation (damn you, global recession!) I'm trying to medicate it at home, using the photos from previous trips as the first aid. 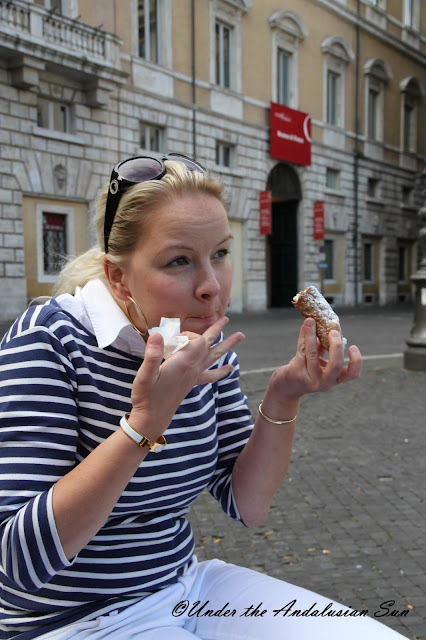 And since I can't seem to shake off the obsession with cannolis, my longing eyes turn to Italy and our trip to Rome a year and a half ago. Rome, as is fitting for a city of its reputation, has left an eternal imprint in our hearts. Kilroy wasn't here. Romans were. The scenery was grand, sure, but I mean... nothing we haven't seen before. Vatican with its priceless art treasures (and the demented serpent-like queue squirming around St. Peter's square for hours) did not evoke interest strong enough to overthrow the antipathy that yours truly harbours for the Catholic Church. But this made my heart tremble like a bride on her wedding night. 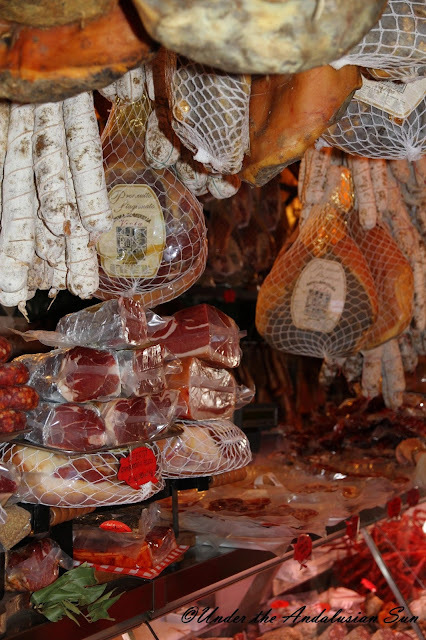 Campo de' Fiore market and Norcineria Viola in particular- a charcuterie in business since 1789-comething. Just look at those noble shapes. That quietly confident, understated elegance. That unrivalled excellence, honed to perfection by centuries worth of craftsmanship. The height of uncompromising artisanal skill. That classic beauty that Michelangelo himself would struggle to capture in marble. Has anything like this been seen since Titian? What is that, glowing in the luscious colours of the first moments of dawn? Porchetta! And there- with the newly ignited passion of first love? Salami Milanese! And there- hiding its feistiness under a calm exterior? 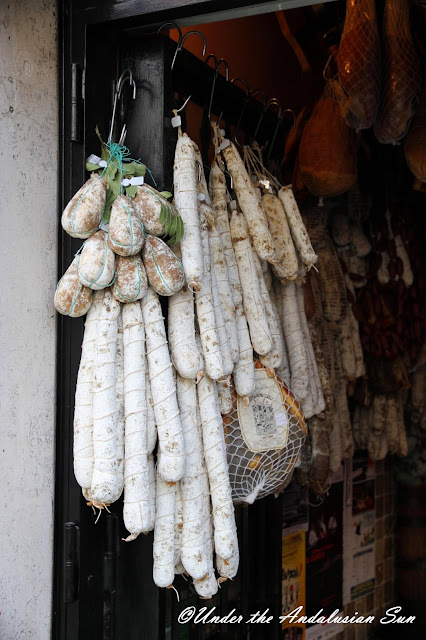 Mortadella! 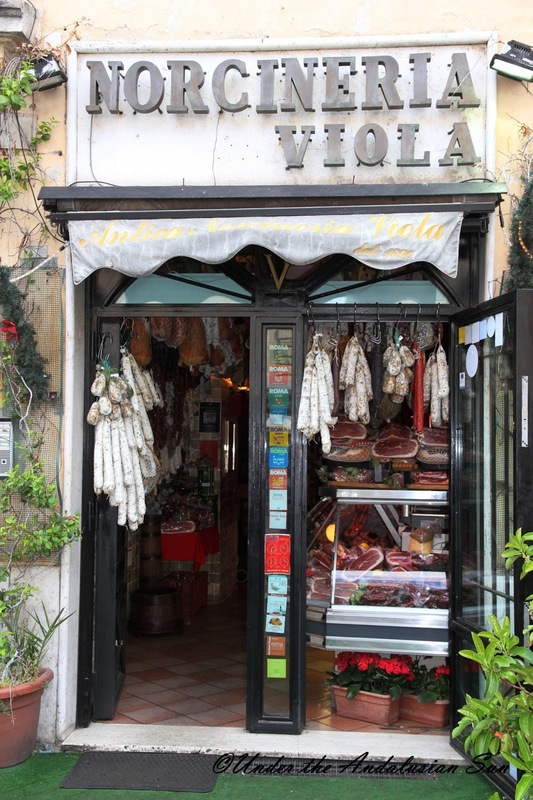 And that Salsiccia, saturated with unbridled joy! You can imagine how happy yours truly was after visiting that shop and having her eyes, soul and stomach nurtured... and prepared for bakery on the next street. What's that? Cannoli for breakfast?! Well, when in Rome. And no need for tears even if your dietary choices rule out the delicacies of Viola- kosherettes will find solace at La Taverna del Ghetto. Their kosher charcuterie is divine (well, almost). I've never had better. Not even in Holy Land.